When considering the Dominican Republic, most people think beautiful tropical beaches, palm trees, luxury beach resorts and beautiful oceans views. While all of that is true there is another side to the Dominican Republic, The Mountains! Don’t get me wrong, we’re not talking about the Alps here, but the 525 foot rise in elevation makes for a whole new experience, and the Jarabacoa River Club is a great place to experience it. The Jarabacoa River Club sits on both sides of the “Rio Yaque del Norte”. The two sections of the club are adjoined by a rope bridge. Small and large swimming pools are scattered around on both sides of the river overlooking the valley and river below. Likewise there are patios, eating locations and clubhouses on both sides giving many unique vistas of the Valley. 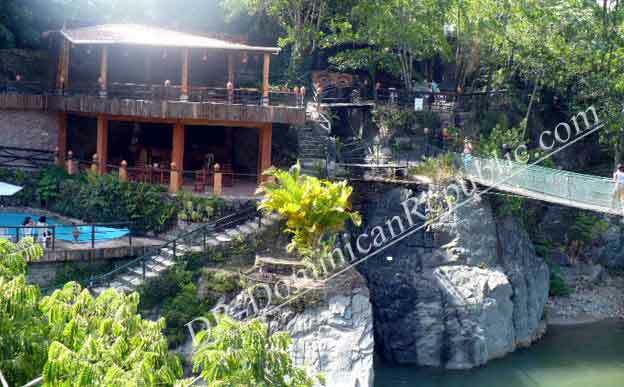 The Jarabacoa River Club makes for an excellent location to set out on the many excursions available in the Jarabacoa area. One of the favorites is the river rafting excursion on the Yaque River that winds down below the club. The price for the rafting excursions is usually about 1,400 pesos per person. First let’s point out that my experience with Viva’s internet is only 7 days. So you can’t call this a long term review of their services. How ever during the 7 days I have been in Jarabacoa there have been internet outages with Viva 3 of the seven days.